Beckman Coulter supplies laboratory equipment to Huntingdon Life Sciences in New Jersey. 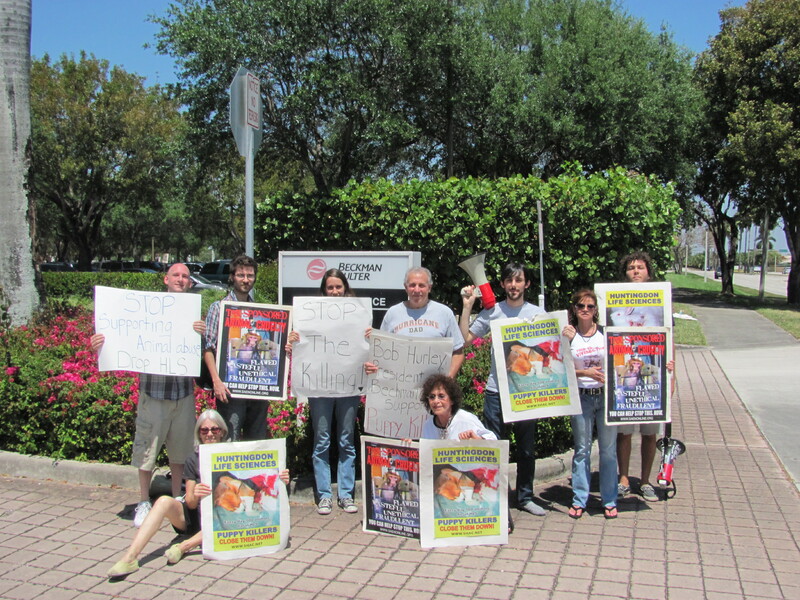 The fact that Beckman Coulter profits off the horrible suffering inside HLS labs was the motivation for a protest on a very hot day outside the company’s Miami location. Nearly a dozen activists stood at the main entrance during the lunch hour as employees left the property. Our message was heard loud and clear, aided by four bullhorns. The presence of several security guards, and a weird guy with a video-camera, helped to make it clear to anyone driving by that we were to be paid attention to. Just wait until protesters are outside some of the employee’s houses. Their neighbors will be shocked and sickened by the news that they live by puppy killers.